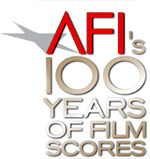 Best Film Scores and Movie Soundtracks: See below AFI's 100 Years of Film Scores, a selection of the top 25 Film Scores voted upon in 2005. Also below, Entertainment Weekly selected their definitive list of 100 Best Movie Soundtracks, dubbed their "guide to the movie soundtracks that move us most." For another reference to the best film scores and film music, see 101 Film Score Milestones, from Film Comment magazine, and AFI's 100 Greatest Songs in American Movies, selected in 2004 for AFI's 100 Years...100 Songs. It was the G7sus4 heard 'round the world. You may not recognize that chord by name, but you'd instantly know it as the ringing opening salvo of ''A Hard Day's Night,'' the soundtrack that turned a nation into a glee club. In 1964, the Beatles had already taken over our radios and TV sets when they decided to commandeer our movie palaces, too. The resulting film was an exhilarating fusion of the backstage musical and postmodern absurdism. To re-create the hysteria that had greeted their ''Ed Sullivan Show'' appearances, the Fabs had to come up with tunes that would out-pleasure ''Please Please Me.'' And they delivered, the film's seven classics ranging from the plaintive ''And I Love Her'' to the ecstatic ''Can't Buy Me Love.'' The music stands on its own, yet is forever tied in our imaginations to the film -- a blitzkrieg of black-and-white imagery that changed the way we see the world. We can't think of a better definition of a great soundtrack. Let's start at the very beginning: Rodgers and Hammerstein's final work first won fans on Broadway. But a better place to start is with the film, in which the tale of singing sibs and their remarkably musical governess in Nazi Austria found its voice in Julie Andrews. If ''TSOM'''s rep suffers hipsters' sneers, that says more about our times than the songs. Is there a more inspiring anthem than ''Climb Ev'ry Mountain''? A simpler expression of comfort amid fear than ''My Favorite Things''? A few weeks ago, these earnest themes seemed outdated. Now, this tale of finding joy in a world gone mad is impossible to resist. Disco might forever be remembered as mere kitsch if we didn't have ''Fever'' to remind us that it was also the unlikely music of emancipation. Whether at a Brooklyn ballroom or Studio 54, disco delivered participatory escapism, and it hardly mattered who provided the beat. ''Fever'' did boast stars, of course, in the Bee Gees, who were busy reinventing themselves as R&B titans just as surely as Travolta became a new dude when he put on those duds. But if ''Stayin' Alive'' was a reason to live, even the lesser lights on this double LP gave us happy feet. ''Disco Inferno'' still makes us want to wear white after Labor Day. Sondheim, Bernstein, Shakespeare... and blade-wielding street gangs? Those first three eggheads might not have seemed the likeliest trinity to end up slumming with barrio boys, but their Manhattan-based update of ''Romeo and Juliet'' was a musical zenith that Callas and the Crips could both enjoy. Is its innocent vision of gangland, articulated in wistful songs, a little bit dated in this post-gangsta culture? Sure. But we still dress up to ''I Feel Pretty,'' still dream of better times to the romantic strains of ''Somewhere''...and, most of all, we still dig the Jets' big numbers. Because we're cool, boy -- real cool. Everything about this movie has been part of our cultural consciousness for so long as to acquire the force of myth. It's unsettling, then, to realize how ''Oz'' almost turned out. ''Over the Rainbow'' was once cut after a preview audience expressed confusion over why Judy Garland was singing in a barnyard. If the final product feels seamless, credit the brains, heart, and nerve of E.Y. ''Yip'' Harburg, whose lyrics and dialogue lead-ins outlined the basic story and emotional structure that composer Harold Arlen and everyone else filled in. Harburg would be ''Oz'''s unsung auteur -- if his words weren't being sung to this day. A textbook case of a soundtrack that artistically dwarfs the film that spawned it, Curtis Mayfield's opus is a testament to the powers of a musician at the top of his game. Mayfield's music imbued the blaxploitation quickie with a moral pulse, taking aim at the scourge of drugs in the inner city. It was one of Mayfield's gifts that his songs could sound joyful and heartbroken at the same time, suggesting the complexities of the human experience. ''Pusherman,'' ''Freddie's Dead,'' the title track -- Mayfield's lyrical high-mindedness would have meant naught if the music weren't as addictive as a drug itself. Rock & roll had seeped into movies by 1967, but most of those films were concert flicks or Elvis embarrassments. All that changed with Mike Nichols' gently satiric swipe at the establishment and the emerging counterculture. Nichols' use of old and new Simon & Garfunkel songs was ingenious: Cue ''The Sound of Silence'' as Benjamin rides a moving walkway to his uncertain future or ''Scarborough Fair'' as his romantic dreams crumble. Even though half of it is devoted to a mood-music score, this landmark introduced ''youth music'' to grown-ups' movies, the reverberations of which are still being felt. The very first shock that audiences got from ''The Godfather?'' That would have to be the music that ran during the opening credits: Instead of the musical blam-blam-blam that one might expect to accompany Mafia mayhem, a distant, mournful trumpet theme slowly swells with orchestration, like an old man's memories slowly filing back. While that tune as well as the film's love theme have become pop-culture signifiers invoking instant parody or homage, the score itself brought Fellini collaborator Nino Rota long-overdue acclaim in America, and it remains a disturbing benchmark for its very sense of quiet. ''Purple Rain'' is a monument to mad ambition. Until '84, America knew Prince as the raunchy Minneapolis groove-crafter behind hits like ''1999.'' After ''Purple Rain,'' he became a movie star (well, momentarily), a scolded corrupter of American tykes, and -- in the minds of critics and fans -- something of a genius. ''Purple Rain'' proved that music was the true object of Prince's insatiable lust, and musically, the soundtrack served up a genre-bending smorgasbord: warped psychotropic funk (''When Doves Cry''), regal power balladry (''Purple Rain''), and classic-rawk riff-o-rama (''Let's Go Crazy''). If you hear ''The Blue Danube'' without immediately picturing gleaming spacecraft doing cosmic cartwheels, you have far greater powers of dissociation than we do. Or maybe you're just one of the few who has never seen Stanley Kubrick's sci-fi classic and had your classical-loving world rocked by his marriage of 19th-century music and 21st-century imagery. When Kubrick dumped the score he'd commissioned from Alex North and decided to use his own temp track as soundtrack to ''the ultimate trip,'' he ensured that few would ever again listen to ''Also Sprach Zarathustra'' without thinking of space babies. The classic Rodgers and Hammerstein song score had already won America's heart via a Broadway cast album. But it got sun-drenched and bronzed when director Fred Zinnemann chose to shoot the film on location (in Arizona). Audiences who wanted a souvenir of the CinemaScope-size movie got a grand one in this album, which happened to sound, yes, as big as all outdoors. ''Oh, What a Beautiful Mornin','' surreys, fringe, friendly farmers, a state anthem so rousing it almost makes our national one seem somnolent -- all this glorious Americana takes us on location, in our imaginations, each time we listen anew. This vital compilation introduced most Americans to reggae music, and for that alone it deserves our lofty ranking. But ''Harder'''s relevance isn't merely historical. Nearly 30 years after its release, the soundtrack remains one of the few non-Bob Marley albums to make it into the collections of casual reggae fans. And it's no mystery why; these 12 tracks -- featuring Jimmy Cliff's spiritual and sweet ''Many Rivers to Cross,'' the rude-boy menace of his title track, and the Maytals' ''Pressure Drop'' -- are as heartfelt and urgent (in their own gentle, loping way) as anything coming out of the States at the time. According to composer Bernard Herrmann, Alfred Hitchcock's instructions were simple: ''Do what you like, but only one thing I ask of you: Please write nothing for the murder in the shower. That must be without music.'' Herrmann was an independent cuss, thank God. The harpy chorus of violin shrieks that accompany Marion Crane's death changed the art of scoring as surely as ''Psycho'' altered film history. But for proof of his greater subtlety, listen to the music during the heroine's earlier flight from the law. It's not so much foreboding as sad -- mourning Crane even as she caroms toward her fate. The song score for Walt Disney's first full-length animated feature wasn't dopey or sleepy, just exemplary. Bonus points for history making: It was the first real soundtrack album ever. Prior to this, no one had taken the actual soundtrack from a film and transferred it to disc -- or discs, we should say, since the original release was on a set of three 10-inch 78s. Someday more princely formats would come, but there's a good reason why this chestnut is perennially in print: The Frank Churchill-Larry Morey tunes proved an original 'toon could equal or better Broadway's musical-comedy best. Believe it or not, kids, there was a time when ''oldies'' weren't cool. That was still the case in '73, when George Lucas asked ''Where were you in '62?'' and helped popularize the notion of nostalgia for the recent past. He even invented a plausible reason for the film's wall-to-wall music, a then-revolutionary conceit: Nearly every character was near a radio tuned to Wolfman Jack. Thus it came to be that a generation of Vietnam-hardened hippies was suddenly grooving to ''Green Onions,'' turning a double album full of artists who'd been bypassed by the counterculture into an unlikely retro smash.